We will explain the advantages of replacement double glazing, what types of double glazing are available, also how much you could save on your energy bills. For many Peterborough residents replacement double glazing is a key way to reduce your energy bills. Surveys show that 44% of people which replaced their windows with double glazed windows, said that they bought them to make their home warmer and to reduce their energy bills. If you decide to replace your windows then we can help you choice the best double glazed windows to suit your home. Double glazing consists of two panels of glass separated by a layer of air. Double glazing has many remunerations over single plane windows, double glazed windows keeps warm air in, insulating your property. Double glazing produces fewer draughts therefore reducing heating bills. The insulation also reduces noise in and out-side of your property. Double glazing reduces the amount of condensation inside of your window. Our double glazing has heightened security, the glass is much more difficult to break compared to single glazing, and they have also increased security locking mechanism and handles. We have highlighted the difference between a single glazed window and our double glazed windows. The house on the left has single glazing as you can see much more heat escaping indicated by bright-yellow colours compared to the image on the right with a more orangery colour indicating heat retained. 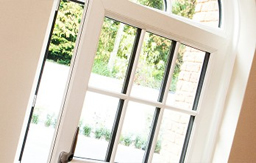 When chosen replacement windows we ask ourselves what types of double glazing frames are there? The most common type of double glazed window frame is uPVC otherwise known as “un-plasticized polyvinyl chloride”. 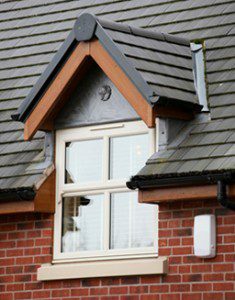 Our uPVC window frames are up to three times cheaper than traditional wooden window frames, uPVC is also recyclable, durable and the most energy efficient window frame. We offer a variety of colours and finishes, including wood look, however white is the most popular choice of colour in Peterborough. uPVC window frames are extremely easy to keep clean, they just require a quick wipe down with a soft cloth. 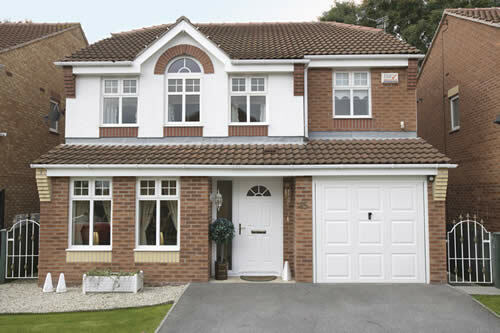 Alternative option to our uPVC is the aluminium frames. These frames do cost a lot more than the uPVC frames however they are a lot thinner and provide a lot more glass. The aluminium window frames also come in a larger colour scheme providing nearly any colour available. The aluminium window frame also has a longer life span. When chosen a double glazing supplier many people get confused regarding the Window Energy Rating (WER) system. You can be rest assured that we only offer A-rated or A+ windows systems. Energy ratings begin at A+ (the best) and go down to G (the worst). Building regulations require at least C-rated windows. Reports have calculated if you replace your windows with our A-rated windows, you safe at around 6.5% on your energy bills if you had previous B-rated windows and 15% if they were C-rated previously. 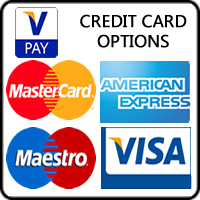 So by saving approximately 15% on your energy, it’s definitely worth getting a free no obligated quote.